I remember when I was younger and I would hear the folks around me say, "the love of money is the root of all evil." I was also reminded in a church that, "It's easier for a camel to go through the eye of a needle than for a rich person to enter the Kingdom of God!" Hearing these things over and over again when I was growing up just made me think to have the money or to be rich was a very bad thing. Because of this I never thought about money, I never thought about being well off, I never thought of living in a fancy home and if I did I felt somewhat guilty about it and I immediately changed my thinking. My parents were regular people. They didn't have a fancy job or fancy cars. We were just normal people trying to live a normal life. Sometimes the bills were paid on time and sometimes it wasn't paid on time. I remember going to the store with my mom and I wanting this Barbie doll. She had a button on her belly that you could press to let her talk. It was soooo pretty. I really wanted that doll to show off on my friends. When I asked my mom for the doll, she told me it was too expensive and to put it back. I remember feeling mad at her because I was a good girl and the least she could do was to give me a doll. I cried of course but that didn't change a thing. She was very firm in her decision. I learned after not ask for what I wanted anymore. I felt like I was asking for the impossible and I was being very unreasonable. That feeling followed me throughout life because even as I got older, once I was asked, " what do you want?" I could never truly answer. I always thought about my answer before I would respond. I would also ask for the cheapest thing on the menu or say I don't know even though I had a long list of things to say in my head. Money is a limited resource and very hard to come by. The rich people are the ones who really make it in life. I won't be able to achieve the things I desire because they are too expensive so I have to change my dreams. The rich get richer and the poor stay poorer. You have to work way too hard to become rich. It's selfish to want a lot of money because other people out there are starving. As time went on and I got older the loans for school and my bills started to become overwhelming. It felt like I was only working to pay my bills and to take me back to work again. I was struggling. This wasn't the life I desired. I wanted to be living on my own, in my dream home, with my husband and my kids by the age of 25 and by 25 I was still living with my mom and the only thing I had that I owned(things i paid for) was my phone, a few pieces of furniture, clothing and my bills! Never would I imagine that this would be my life but you know what I realized. There was something missing. You know what that was? The money would solve the problems I was having. The money would pay my bills and help me to live the life I wanted to live. Money, money, money, money, money, money, money, money, money, money,money, money, money, money, money, money, money, money, money, money, money, money, money, money, money, money, money, money, money, money, money, money, money, money, money, money, money, money, money, money, money, money, money, money, money, money. I had no desire to be filthy rich but I wanted to be comfortable. All these negative beliefs were instilled in me from a young age and I never questioned it. I just believed what the older folks said. Once I changed the way I saw money and looked at it as a medium of exchange, everything change. I don't love money. I don't desire money. I desire a life. A life where I can be comfortable and can afford what I want because I remember when I didn't have. I have no desire to show off but to just live my life, see my business strive, raise a family, inspire others to live their best lives and enjoy what is left of my time here on earth and I need money to do that. So I work hard in exchange for money. Once I changed my thinking, I started to seriously go after my goals. I became comfortable freelancing and asking my clients to pay me what my work was truly worth. I was able to make enough money to take me out of the debt that I was in and live a comfortable life. I am nowhere near my ultimate goal yet but I will get there. 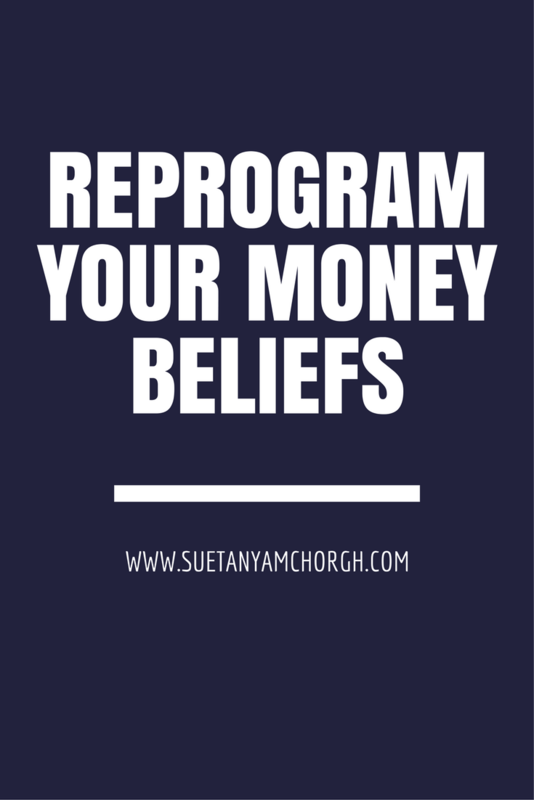 Identify the negative money beliefs. They may be similar to the ones I mentioned above. Replace that belief with a positive belief. Popular belief: Money is evil. Positive belief: Money is not evil. You can do good things with money. You can donate to charity, you can buy food when you're hungry. You can buy clothing with money. You can pay for education with money. So money isn't bad. However you can do bad things with money. Know that those are different and choose to do good things with money. Believe and practice living this new belief. Always remember this, your beliefs drive your behavior. It's your behavior that create results. Whenever you change what you believe, the results come effortlessly! In other words your mind is a powerful thing. Feed it positive things and just see what happens. What’s one money belief that’s holding you back?- comment below.